Relyence FRACAS has built-in support for customized Workflow, Approvals, and Notifications for full process control and compliance. The Relyence FRACAS Workflow Editor enables you to customize issue management based on your unique workflow. The Workflow Editor is tailored to your specific process workflow requirements and your team structure and permissions. The entire process is configurable in the easy-to-use, intuitive Workflow Editor – from workflow steps, to approval set up, and notification messages and scheduling. Start with one of the built-in problem solving processes, edit it as you desire, or create an entirely custom process. Your Relyence FRACAS Workflow is controlled automatically for you when you establish your Incident and Problem process management step flow. For example, if you utilize the built-in 8D Problem Workflow for problem handling, your Workflow will reflect the 8D process from Establishing the Team (D1) to Close Out (D8). Or, if your elect to use the Six Sigma DMAIC, your Workflow will reflect the 5 step process from Define (Step 1) to Control (Step 5). The Relyence FRACAS Workflow steps are completely customizable, so if you use one of our out-of-the-box processes, customize an out-of-the-box process, or create a completely custom process, the Workflow Editor automatically adapts and controls your workflow process accordingly. 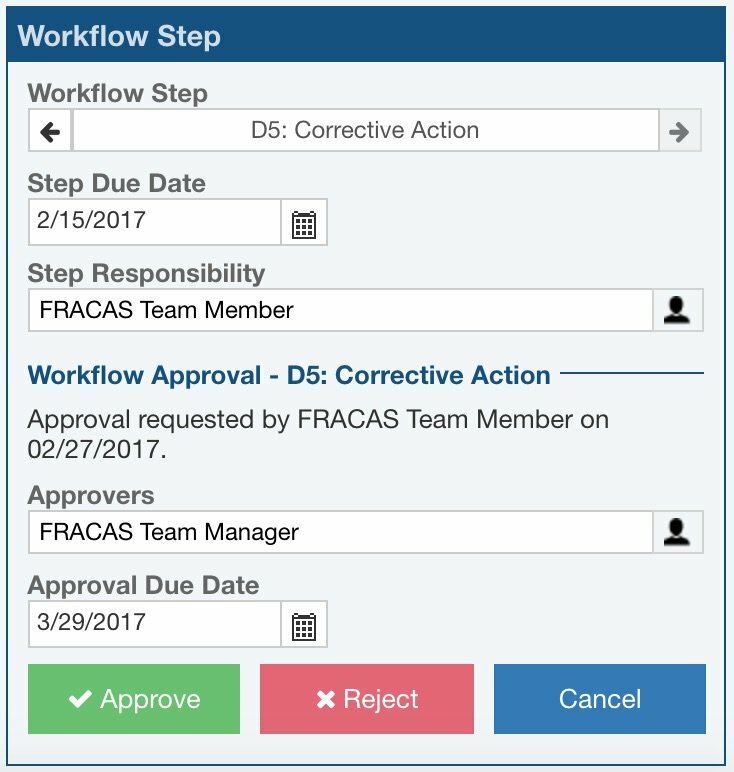 Relyence FRACAS supports Approvals as a mechanism for you to control your FRACAS Workflow process. 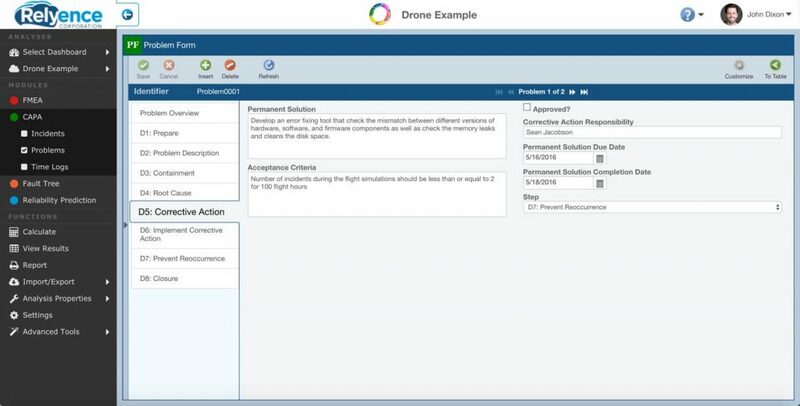 If Approvals are not enabled, then any team member with permission to access your Relyence FRACAS Analysis can move an Incident or Problem forward and back through the Workflow process. When Approvals are enabled, Incidents or Problems cannot be advanced to the next step in your process until approval is received. You define which process steps require Approval to advance, who is allowed to Approve, as well as Approval Due Dates. Relyence FRACAS automatically handles requesting approvals as necessary, advancing the workflow upon approval, and tracking the cause of rejection if approval fails. Relyence FRACAS comprehensive platform for issue management includes support for customized Workflow, Approval control, and scheduled Notifications. Relyence FRACAS includes a variety of customizable Notifications to keep your team apprised of system status and on task. Relyence FRACAS enables you to set up a variety of Notification emails to be sent to team members to notify them of important events in your FRACAS process. Notifications are an important element in keeping team members informed about events that occurred, upcoming due dates, overdue actions, etc. You can customize Notifications completely to your requirements: select which team members receive the Notification, the subject of the email, and body text of the email message. Messages can include links to the appropriate failure report, so recipients can click and be taken directly to the appropriate incident or problem. Send a Notification when the Workflow Step either advances or regresses to another Workflow Step. Send Notifications on a recurring basis depending upon scheduling selections. Send a Notification when an Incident or Problem is approved. Send a Notification when an Incident or Problem is rejected. Send a Notification when approval is requested. For recurring Notifications, you can enter the start and stop dates, and the frequency of the Notification. The Relyence FRACAS Dashboard provides the added capability to view your process tasks at a high level. 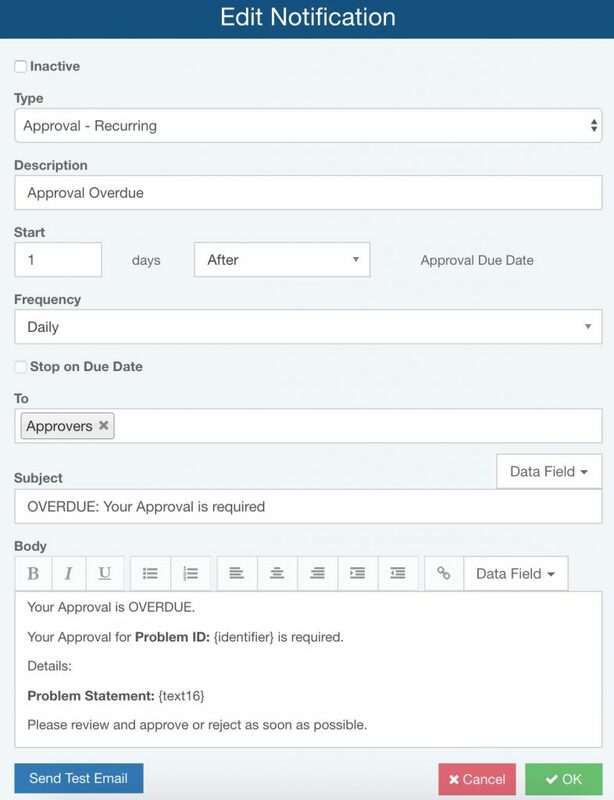 This enables managers or team members to be kept up-to-date with action items, overdue tasks, pending approvals, etc. Using the Relyence FRACAS drill down feature allows dashboard viewers to be taken to the outstanding issues for more details. 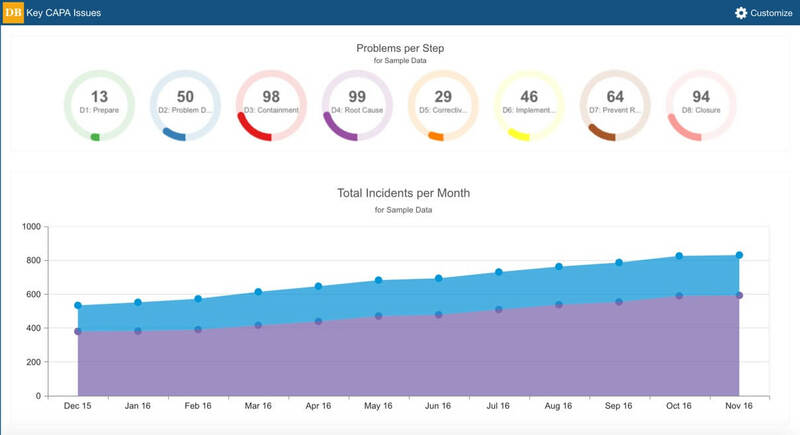 The Relyence FRACAS Dashboard means that your process remains on track and in control at all times. The FRACAS Dashboard can provide high level visibility across a single system or your entire system operation.